KTM showed the first prototype of a “zero emission” motorcycle in October 2008, a project that was the result of the company’s cooperation with the Vienna Development Institute “Arsenal Research”. Now, 18 months later, the sports motorcycle manufacturer from Mattighofen in Austria is right on target for the release of the first series-ready KTM electricsports motorcycle. Under the title “Freeride” KTM will present two near-series prototypes at the 2010 Tokyo Motorcycle Show, which in one year’s time will transfer the sporting spirit of the brand that is always “Ready to Race” into a series model fit for the 21st century. 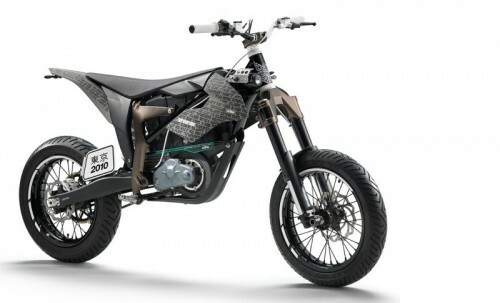 With its first zero emission motorcycle, the world’s leading producer of offroad motorcycles has developed an electrically driven sports motorcycle that proves that riding fun and environmental sustainability need not be in conflict with one another. The cornerstone of this development is the clear commitment to offroad motorcycle sports and the obvious intention to go on the offensive by further expanding the strongest part of the company’s business activities with a unique product that, as yet, does not exist in this format. This revolutionary development embodies completely new perspectives: Freeride also stands for the end of motorcycles fleeing the city and the accepted return of sporting motorcycle events in urban areas. Frame: Lightweight Delta Box frame with forged aluminium components. Self supporting tail in monocoque design. Suspension: Up-side-down fork and shock absorber with variable setting. Progressive damping system. Brake system: Hydraulic brake system with hand operation for the front and rear wheel. Radial brake system with recuperation support through brake energy. Engine case: Combined drive casing in light metal design and all inclusive system integration. Drive motor: Permanent energized synchronous motor in shrunk-on-disc construction. Engine management: Modular high performance power module with integrated system and “Drive by Wire” security management. Transmission: Direct drive without clutch with gear transmission and chain. Traction battery: Plug in battery in li-ion (lithium-ion) technology. Significantly better images (read: viewable) of the KTM Freeride electric motorcycle have been leaked by a German motorbike magazine, click through for the full gallery.